During my searches of Alameda streets for vintage iron, I've found a fair number of 50s cars but nothing much older than that. Until now, that is. You can still use a 50-year-old car as a daily driver, but it's probably not a great idea with a 70-year-old machine (even if the machine packs a 346-cube flathead V8, as this one does). This Cad was parked in front of the house where the '57 Pontiac Star Chief lives; I'm guessing that it normally lives in the garage and was parked on the street for some special occasion. Now that's a car clock! It's a little strange to see a big luxury sedan with a floor-shift manual transmission (it's hard to make out the shifter in this photo); maybe cars really were better in the 30s! Gotta hand it to the old Caddies- that's an impressive front end. You could get your '37 Cadillac with V8, V12, or V16 power, so this one's more toward the inexpensive side of the Cadillac spectrum. 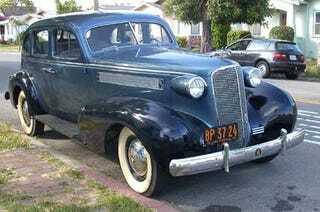 Still, '37 was a grim Depression year and not many had the scratch to pay for any Cadillac. The Cadillac logo used to be far cooler, prior to the rococo version of the 50s and the Caddy-that-zigs recent incarnation. More ducks! This is a very straight, clean car, but clearly not an obsessive show queen. It's got a pretty respectable collection of minor dings and nicks, plus there's the matter of the missing hubcap. I tell you what, if I owned this thing it would get driven regularly, by gum! Too bad Prohibition ended a few years before this car was built, because that trunk would have been ideal for hauling cases of Canadian whiskey across the border.